Prior to release of the memo, the FBI issued a statement expressing the agency’s “grave concerns”. One of the grave concerns – echoed by every left-leaning talking head – was that national security would be put at risk because the memo discloses our intelligence agencies’ sources & methods. Usually, that means releasing the names of undercover operatives … or identifying intelligence “partners” … or disclosing technological information gathering techniques (say, bugging another government’s conference rooms). Revealing those sources and methods would be a serious matter. Did the memo, in fact, reveal sources & methods? The short answer is “yes, it did” …. (1) The infamous Steele dossier … which all agree was funded by the Clinton campaign machine … and which Comey said was laden with “salacious and unverified” information. Key point: A prior FISA application was rejected. This one was approved. The difference: this one had the dossier stapled onto it. Therefore, the dossier must have been a determining component of the application. Period. Are you kidding me? Yahoo News. My wife has a Yahoo email account which – as a convenience for her – I have set to load on our Internet Explorer launch page. Along with her latest emails comes Yahoo News headlines. So, I ask again: Are you kidding me? 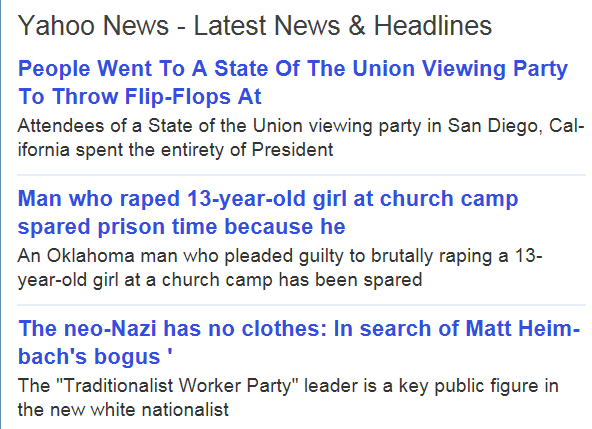 Yahoo News. That’s where our super-sleuths get their hot information? Given the reliance on Yahoo News, I assume that a heretofore secret method is Googling. Plug in terms like “Russia” and “Carter Page” and see what you get. What will our super-sleuths do now that their methods’ cover is blown? The only other clandestine method that I could discern was marrying somebody working for a politico’s op-research organization … squeezing him / her for tidbits during pillow-talk … and then reporting the morsels to the FBI as hard facts. Perhaps, the most sensitive method that was revealed was forgetting to alert the FISA Courts that that the information used in a warrant application is unverified information gathered from a sleazy political campaign operation. This entry was posted on February 5, 2018 at 6:59 am and is filed under FBI, Numes' memo, Trump, Donald. You can follow any responses to this entry through the RSS 2.0 feed. You can leave a response, or trackback from your own site. The real audacity here isn’t the fact that the FBI cites a Yahoo article – it’s that that Yahoo article is based on the Steele Dossier and the FBI used the article to corroborate the dossier.